Andrés Lopera is starting his third season as the music director of the Metropolitan Youth Symphony. A native of Columbia, Lopera holds a Master’s degree in orchestral conducting from the New England Conservatory of Music, a Master’s degree in trombone performance from the University of Texas at Austin, and a double degree in conducting and trombone from the Universidad EAFIT in Medellin, Colombia. Since you are a trombonist, do you bring it to rehearsals? Lopera: Sometimes to give a little extra encouragement to the brass section, I’ll grab my trombone and come30 minutes before the session and do some warm ups with them, talk about technique, and work with them a bit. It’s really good because we have all of the kids from all of different brass levels. 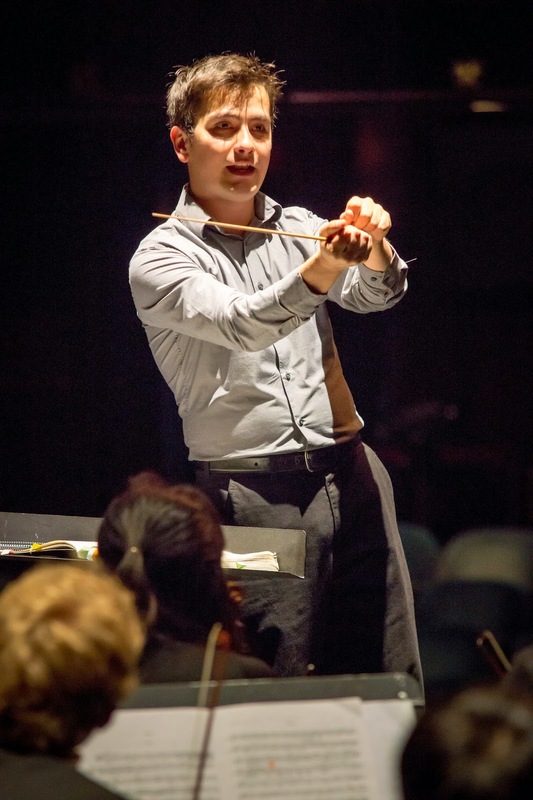 How did you get into conducting? Lopera: I enjoy the trombone repertoire, but I wanted to go farther. I wanted to expand my horizons beyond playing trombone. I wanted to understand the other instruments in the orchestra. I come from a little town in Columbia, and we didn’t have violins for people like me. Wealthy people had violins, but that was a different situation. I played trombone in salsa groups, jazz groups, a town band, a ska and reggae group, and a university orchestra. I used to put quintets and small ensembles together for little concerts. I got interested in studying conducting, and my teachers said that I had really good leadership qualities. I talked to the professor who taught conducting at my university, and told her that I really wanted to conduct. So, she began to teach me. So, it was really great that the trombone gave me a lot of versatility. It allowed me to play in different groups and earn some money for my university education. One of the wonderful things about MYS is that we try to instill versatility in our ensembles. We have three levels of jazz, three levels of band, and six levels of orchestra. One of the things that we are trying to capitalize on at MYS is the international relationships that I have. So we are doing Skype sessions with the musicians of an orchestra called A Far Cry, which is based in Boston, Massachusetts. I know a lot of the members of that ensemble from my studies at the New England Conservatory. So we used Skype to pair up leaders from my chamber orchestra, which is all strings, and they received lessons from the professionals. A Far Cry came to Portland last January for a concert, and after that they came to MYS and worked with my kids. It was really fantastic. Last year, I conducted a piece on the season-opening concert of the New World Symphony in Miami. It was Gershwin’s Cuban Overture. I also got to work with Michael Tilson Thomas on the other pieces of the program. Another great thing was a discussion that I had with him about Beethoven’s Fifth Symphony. We talked about it for three hours. Then after I returned to Portland, I had that piece on one of my MYS programs, and Michael Tilson Thomas called me to find out how it went with the kids. That was a really nice thing to do. We also used Google hangouts to work with Michael Tilson Thomas and other professionals, like the concertmaster of the Dallas Symphony Orchestra. It’s been really great for our kids. We have worked with musicians from the Oregon Symphony. About 20 of them came to one of our rehearsals last season and played side by side with our musicians while Carlos Kalmar conducted. My students learn a lot just by listening and by example. We have a lot of great coaches from the Oregon Symphony, as well as other excellent local professionals. But one of our main interests is to create leaders in our ensembles who can become leaders at their local schools also. We are doing a lot of building at the local level. We are using our ensembles to reach out to schools. For example, we went to the César Chávez School. I talked to the kids there in Spanish. Everything went very well. We have a new program called Beginning Strings for students who attend underserved elementary schools. So we cover music from a very wide range of abilities. How many kids are involved in all of the MYS programs? Lopera: I think that we had 480 students last year, and it will probably be about the same this year. Around 85 are in the symphony orchestra. Do you have to motivate the students? Lopera: No, that’s because the kids are already very motivated. They are willing to give up time watching TV or on the computer to learn how to master an instrument and make beautiful music. It really helps to develop their brain, and it will help them later in life when they are in college. They are very motivated to take three hours out of their Saturdays to come and work at rehearsals. It’s great to see that they want to do well. My job is to keep them challenged, treat them as individuals and young professionals, but be demanding. I love their energy and sometimes they come up with funny things. Last year, they gave me a gigantic basket filled with college food: instant soups, cookies, and cans of tuna. I had told them that I wasn’t a good cook, and they said, ‘don’t worry, we’ve got you covered.’ It was really cute. Your orchestra has already played at the Waterfront Concert at the end of last month. Tell us about the concerts you’ve planned for this season. Lopera: The Waterfront concert was a first for us, and it went really well. For our December concert, we will play Tchaikovsky’s Symphony No. 4. That’s a big challenge for the kids. We’ll also play Glinka’s “Ruslan and Ludmila Overture.” The concert will feature some of the other MYS ensembles like the Concert Orchestra and the Interlude Orchestra. For our spring concert, we will again collaborate with some choirs. This year we will do opera choruses. We will have a lot of singers in the loft. The concert will have some surprises, too. This concert will be a wonderful opportunity for the symphony orchestra to work with singers. It will be really wonderful. Our last concert will have music by Brahms. We will play his “Hungarian Dances” and the Symphony No. 4. We will also have a piece that will feature the winner of our concerto competition. Have your parents been able to come to Portland to see you conduct? Lopera: Not yet. Portland is a long ways from Columbia. I send them a DVD of my concerts here with the MYS. I’m the weird kid in the family. I’m the youngest of seven, and the only one to live outside of the country. But they have seen me conduct orchestras in Columbia. In March, I conducted my university orchestra and a professional orchestra. My parents and all of my siblings were there. It was a beautiful experience.